I want these so bad... I have too many VHS, LDs, DVDs, and Blu-rays to fit on my shelf right now though... Mostly just want a movie blu-ray box set since I missed out on the R2 DVD set for that. Are you referring to subtitled/dubbed or non subtitled release ? If you're after the dub/sub you're in the wrong thread - go to the Viz thread - up to Super S already out. It's all very tempting, but it would be nice if they had the nice stuff from the laserdiscs... that I would totally buy if I could be sure they didn't have laser rot or deep scratches..
SuperS Blu-ray Boxes announced for May 8th & July 10th. That illustration of Usagi on the first volume is one of my favorites. It's great to see it in full without Chibiusa blocking it. I much prefer, the illustrations drawn by the Japanese. I find that the drawings found on DVD or other (France, Italy, Germany, USA) are too recent and don't reflect the year of production. Then I don't like draughtsmen who just copy existing drawings. Boo no box this time . Why can't they be consistent!!!!! I totally agree. Plus you can see it's handdrawn, which combines with the series itself. It's interesting and weird in a good way to see a SuperS picture with Super Sailor Moon and Pegasus WITHOUT Chibimoon (vol. 1 cover). I like Marco Albiero's art, but it's cool that these Japanese releases use actual artwork from the show. Yeah, that's the one weird part. Like what someone said, they should have switched it so the first forms were in part 1's cover, and part 2's cover having the Super form. Also, with the Super form cover, what's with the / hugging thing, were they trying to add some yuri vibes? This is VERY old art, I guess Laserdisc art. I don't think it's romantic. ^Yeah, most of them were separate so they were put together here. 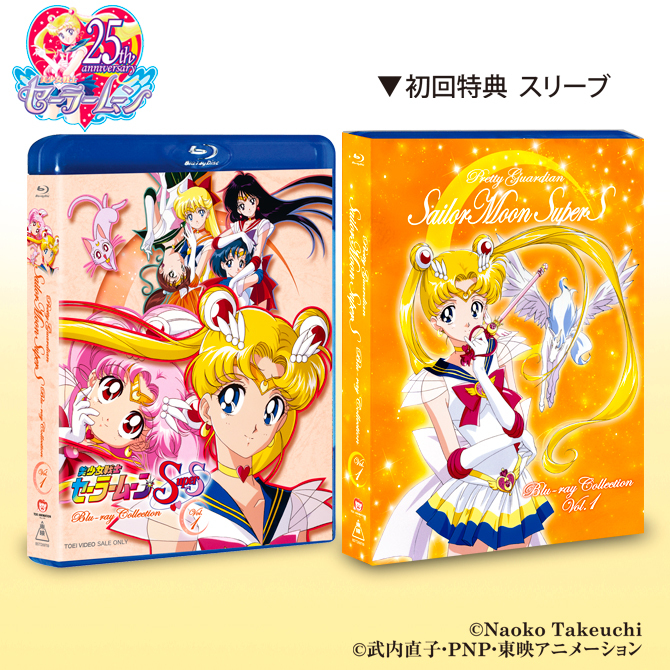 Set 1 uses art from Volumes 1 (Moon), 2 (Chibi Moon & Diana), 6 (Mercury & Mars) & 7 (Jupiter & Venus) while Set 2 uses art from Volumes 3 (Mars & and a NOT upside-down Jupiter), 4 (Mercury & Venus) & 9 (Moon). As for the boxes, 1 is from the LaserDisc Box while 2 is from Volume 10. 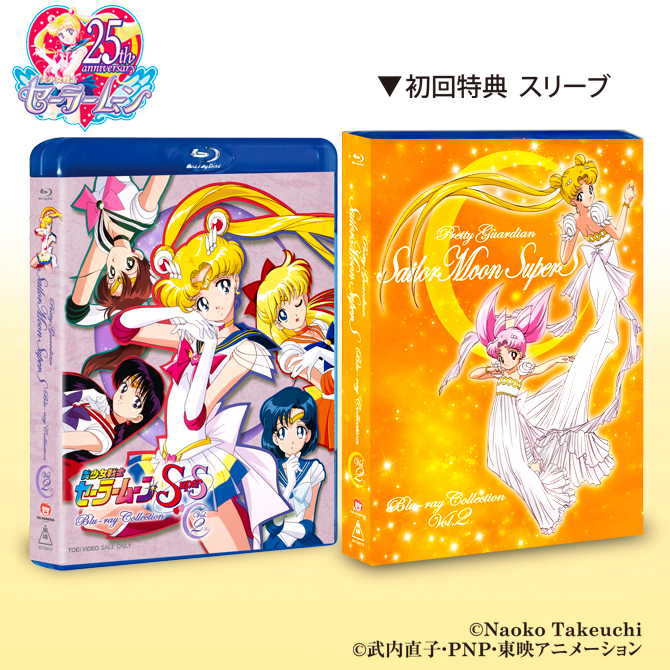 Well no box to put them in this time so Toei won't see me paying full price I'll take mine at 25% off again thanks. Some of the "bonus" items this time are shockingly cheap - a tote bag and a poster ? That's probably mass produced a few hundred yen at most but adds a few thousand yen as you pay full price instead of deep discounted price.